I love the title and the message behind the introduction to this book: “Your Kids Are Not Your Report Card.” Much too often I feel this way. My daughter glides across the balance beam and helps a friend whose afraid of the bouncy house in gymnastics and I’m on top of the world. Grade = A. The next day she has a rough time sitting still at a church function, gobbles up all the brunch food, and whispers in what might best be described as a quiet shout. Sigh. Grade = C-. This habit of using our children’s behavior as a measurement of our parenting skill leads to disappointment, frustration, judgement and envy of others, and yo-yoing between shame and pride. It leads to us worrying more about appearances and possible embarrassment, than focusing on securing a strong, bonding relationship with our children and strengthening their relationship with God. This book was a wonderful reminder that my kids and their ability to follow God’s path should be my main focus in my everyday; not whether the mother next to me notices how many words my son knows for his age or if the lady in the grocery store saw our potty accident. Total Family Makeover lays down a road map on how to better build your family’s relationship with Christ. 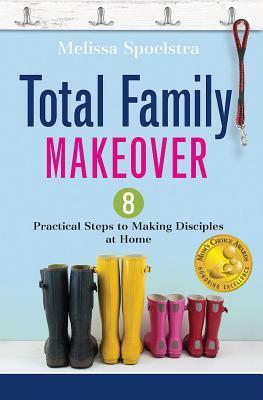 There are 8 steps included in this book that aim to give your family a total makeover and refocus you on Christ. Finding community in the church. The author provides tips and practical advice on how to make these 8 habits part of your family culture. Begin to build your family discipleship and become the key disciple-makers in your children’s lives with Melissa Spoelstra’s new book, Total Family Makeover. Disciples are made, not born. Whether your children are babes in arms or teenagers getting ready to leave the nest, making disciples at home starts with you! Give your family a makeover with this practical approach to helping your children learn what it means to be a follower of Jesus. ***The lovely folks at Litfuse Publicity were kind enough to send me this book for review. You can find more information about the book and additional reviews on the Total Family Makeover landing page.